Alas, Grey Day has dawned upon us once again in all of its overcast glory. Hey - what's not to love about this special occasion? It's not a day to mark your calendars on for nothing! Which is why we all need to contribute in a Grey Pet Appreciation Celebration. It even has its own catchy little ring to it! Sort of. So, get off your couch and go treat your Grey pet to something nice. It's the least you can do. After all, they are the most miserable type of Neopet in Neopia. Well, here it is -- 10 ways on how to turn your Grey pet's frown upside down. 1. Take your Neopet to the Healing Springs. Wait -- huh? You haven't healed your Neopet? Come on! The guy's already depressed as it is, and you haven't even healed it to full hit points? Tsk, tsk. Once the Water Faerie's done her implausible magic, your Grey pet could have a chance of being over 9% more content than usual! Healing Potions are a good way to revive your weak pet, as well. 2. Buy it some toys. Really, anything! Plushies, old fashioned Yo-Yo's, Dolls, Usuki Play Sets... the possibilities are endless! *Pssst... you should hand it a Grey Fuzzle... your Neopet probably wants to feel relatable to some items in Neopia. What Neopet actually wants to be alone? * Every Neopet likes to have its own fun here and there. Unquestionably, your Neopet will be feeling at least a little less down. Tip #1 - never neglect your pet. Whoa, there. Grey Day isn't just about the Neopets! It could be literally anything that has to do with this colour. Now, this isn't a test, but when was the last time you fed your pet? Be honest. Last year? WHAT? Neopets are living creatures too, you know! That must be why your Grey pet looks the greyest of all. Let's list some food that accompany this special occurrence. A. Greycorn - Yum! That sounds like a wonderful snack for your little guy. Just what he needs to fill up his tummy. Maybe not all the way - but it'll do some justice. B. Grey Hot Dog - Now, there's something. A Grey Hot Dog, with a whopping amount of Squeezable Tears on the side! Heh, heh... heh. C. Grey Cheese - All the jam packed flavour of dairy, including a hint of black and white. D. Grey Pizza Slice - Who doesn't like pizza? Now this will make your Neopet joyful. One slice and your pet will be on cloud nine. E. Grey Sandwich - This is the total package! Grey bread, lettuce, cheese tomato, and salami? Yes, please! F. Grey Ice Cream - Dessert, too?! This day just keeps getting better and better. G. Grey Doughnut - It may be a little soggy from the hovering raincloud, but what tastes better than a tasteless, wet doughnut? Nothing! And for the healthy Neopian, you can also pick out a Grey Turnip, or a Grey Scorchipepper. You never know - it may even taste more tasteless than the ice cream... just what Grey pets love! Tip #2 - the more bland, the better. Whether your Neopet has great looking features or not - they could use a little bit of Eye Shadow. Purple will do the trick. It brings out their smile! Say cheese! Uh... unless you want to eat something else. Just look above. A brush can manage your pet's hair, too! With all that rain above their heads all day, it'd get a tad frizzy, don't you think? Your pet will then look AND feel good! 5. Fighting Off Your Despair. Ring, ring! Who's that? It's the Battledome calling! Ahh, yes; the Battledome. Who says just because your pet isn't the happiest means it can't win a good battle? I suggest you try battling in the 1-player BD, starting with the easiest opponent, and then working your way up. That is, if you've equipped the right tools. This will make your pet feel brave and confident. We all know our Neopets need a buddy to hang around with when you're not there. Giving your pet a new friend will make it feel less lonely. You can even attach a Petpetpet to your Neopet's Petpet (what a mouthful... ) because the more popular your pet is, the more happier he'll be. Surround him with nice looking friends (not angry looking ones!) and they'll all be bundles of joy - and maybe even encourage your Neopet to be a happier camper! Just about every Neopian knows what the NC Mall is. Have you got some NC on hand you're willing to spare? Your Grey pet looking too plain? Well, keep on reading, because this will be one of the most effective ways to make your pet pleased. You don't have to go all out -- but try to do your best. A pretty background, some bright clothing, and perhaps even a cheering tune will have your pet in high spirits! You want to make it look great. The brighter context he's in, the more happier he'll stand while being surrounded by light. Whether it's Destruct-O-Match II, Hannah and the Kreludor Caves, or even Dubloon Disaster, your pet will be joyous and mesmerized by the wonderful games Neopia has to offer out there. Catch your pet saying that today's not a very good day? Play a game! Twenty times more effective than playing with a toy. Just remember to always let your pet win. Always. 10. Give Up? Paint Your Grey Another Shade! Alright - so you've tried everything from complimenting your pet into happiness to going on Tiki Tours, but your pet is still giving off that negative, depressing vibe. Is it also bringing you down? Do you feel like you're a hopeless, smile-unworthy owner? 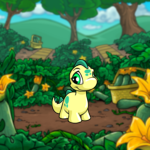 There's only one thing to do... buy a Paint Brush (possibly even a Transmogrification/Morphing Potion) and transform your pet to a grinning, positive Neopet like you've always wished for. Of course, you're gonna miss some of that usual grimacing glare-like attitude, but if you're absolutely sure you want to do it, go right ahead! Now, I'm not saying you shouldn't treat your other, non-grey pets the opposite way. You should always give your Neopet little surprises now and then, if not, everyday! Be sure to love, care, and prove to your pet that you're the best owner it can get. Every Neopet should be treated like a King or Queen. P.S. The list above is not 100% accurate. There is no guarantee your Grey pet will end up with a smile on its face. But if it is beaming with joy... consider yourself one of the best Neopian Grey Pet Owners out there. Well done!